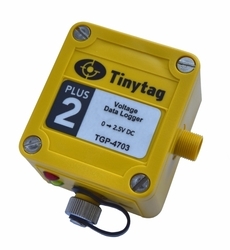 The TGP-4703 is a voltage data logger that is supplied in a robust, waterproof case. It monitors voltages from 0 to 2.5V DC. Loggers can be factory configured for use with a third-party sensor, for applications such as pressure and wind speed monitoring. To confirm that this logger can be configured to work with a specific sensor, please submit our Custom Scaling form. This logger requires Tinytag Explorer software and a USB download cable (CAB-0007-USB). The logger is supplied with an input lead (CAB-3239) to connect it to a third-party sensor. For sensors that already have an output cable, a 5-pin connector plug (ACS-9703) is available separately. This data logger can be factory-configured for connection to a variety of third-party sensors, allowing it to be scaled to show readings appropriate for the sensor it is attached to. To confirm that this logger can be configured to work with a specific sensor, please submit our online form.